If you’re planning on traveling with your family pet, we want to make sure you and the pet are as safe as possible. Come to Budd Baer Mazda and see what we have in the way of pet travel supplies. We can also offer you some helpful tips on making traveling with your pet as safe and fun as possible. As much as pets enjoy traveling with their owners, it can be scary for a pet if it’s new to them. Make sure they’re comfortable before leaving home and have the pet contained in a crate or kennel and situated in the back seat. You may bring along small treats but avoid meals until the trip is done. The best way to ensure your pet is comfortable is to have an appropriate vehicle. Stop at our dealership and test drive one of our pet-friendly vehicles. 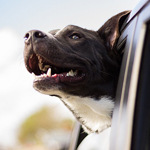 Bring your pet, and see how your pet likes the vehicle.